The Access Control List function of Joomla controls what part of content the users are able to see or which actions they can take. This restrictions are applied for groups, each group can be thought of as a role that a user will have for the site. Keep in mind that one user can be a member of one or more groups within Joomla. If desired, groups can have parent groups. In this case, they automatically inherit the Access Levels of the parent group. Auction Factory comes with its own ACL system implemented which uses Joomla groups and that can assign them to either Bidders or Sellers, having automatically set restrictions for accessing various pages of the component or taking certain actions. 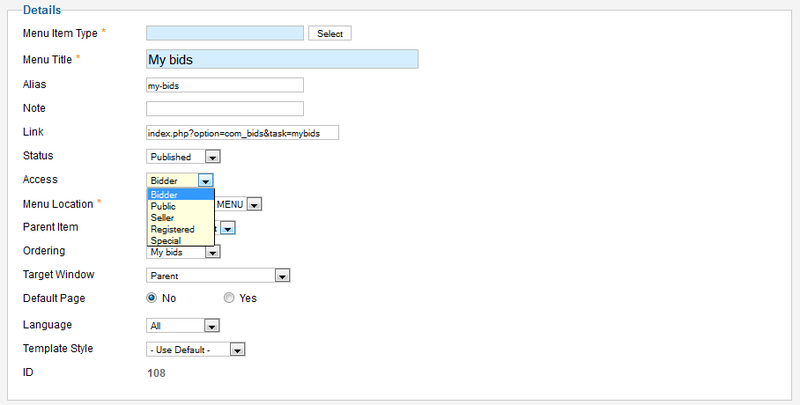 With this feature configured, when a user wants to visit a specific page, the system checks the permission for this combination of user and action. If it is allowed, then the user can proceed. Otherwise, the action is not allowed. First and foremost, you should create specific groups for them. There, add at least two new groups, their names can be Bidder and Seller but you can also set your own names if you wish so. 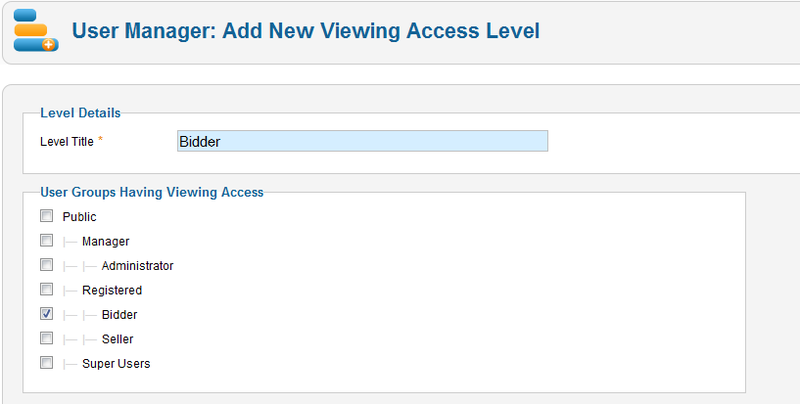 Set access level group to 'Seller' for menu items: 'New auction', 'My auctions'. You can leave 'List auctions', 'Search' and 'Categories' with Public access or only for Registered, as you consider.